@JessPWhite #NDCLondon What Is A Dashboard & Why Should I Care? @JessPWhite #NDCLondon Do these metrics help you in real life? @JessPWhite #NDCLondon Where Can I Learn More? View A Practical Guide To Dashboarding on Notist. Dashboarding, also known as visualisation, is a difficult thing to do. First, there is a vast choice of tooling and setup. Then, figuring out what information should be displayed, where and why can be confusing. Together we will journey through a practical tour of dashboarding. Focusing on metrics, we will go through some of the common patterns for services and API’s that can ensure your visualisations and dashboards are useful. Finally, I will demonstrate building a dashboard using these patterns using StatsD, Graphite, and Grafana. 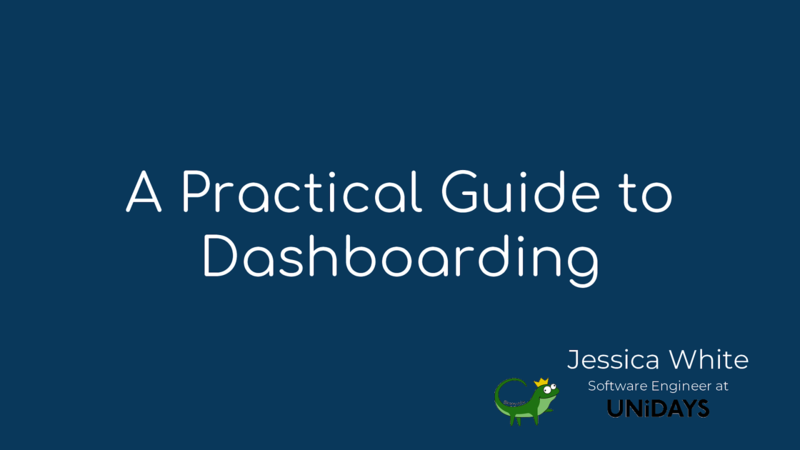 This will be a whirlwind tour from start to finish on how to get started making useful development dashboards. The demo demonstrated in the talk that you can go through yourself. Starting off the second day of #NDCLondon with @JessPWhite and practical guide to dashboarding. Great talk and really interesting. Def something to take back to work. Thanks!